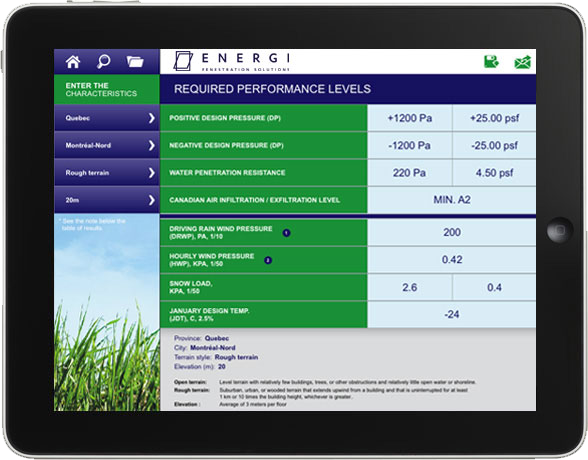 To enable customers, fenestration product manufacturers and their stakeholders, as well as consumers, to select products that conform with the Canadian National Building Code and Provincial / Territorial / Municipal Building Codes, ENERGI has designed a Window Performance Grade Calculator. This handy tool will allow you to establish the required performance grades for a specific building (based on terrain conditions, building height & shape) by using the existing climatic design values of more than 640 selected Canadian locations included in the 2010 National Building Code. Combination configurations & sizes are reviewed and provide Performance Grade data based on the mullion reinforcement design.